Researchers from EPFL and the Centre Suisse d'Electronique et de Microtechnique (CSEM) have analyzed a number of obstacles – and identified solutions – to equipping buildings with photovoltaic technology. Their findings have been published in Nature Energy. Laure-Anne Pessina, Sandrine Perroud, journalists at Mediacom, conducted an interview with Professors Christophe Ballif (STI) and Emmanuel Rey (ENAC), two of the authors of this cross-disciplinary study, also project leaders of the ACTIVE INTERFACES interdisciplinary research project. Why are architects often reluctant to incorporate photovoltaic systems into buildings? Emmanuel Rey*: We identified two main reasons for this through our work on the “Active Interfaces” cross-disciplinary research project that is being carried out under the "Energy Turnaround" National Research Program (NRP 70). First, in many cases architects are simply not familiar with the latest technological advances in this area and their financial implications. Second, there is a lack of persuasive precedent in the field of architecture. In other words, we have few good examples to draw from, particularly when it comes to renovation projects. Christophe Ballif**: There is also the cost issue, of course. Building projects with a solar-energy component are generally more expensive, especially if this component was not addressed from the outset. What can be done to rectify this situation? E.R. : In view of the coming energy transition and stricter legal requirements regarding the use of renewable energies, demand for solar energy is set to rise. A real paradigm change is in the making, where building-integrated photovoltaics (BIPV) will already be factored into preliminary architectural designs. We therefore have to enhance the knowledge of all those involved – project owners, architects, specialists and contractors – for a corpus of successful works to take shape. There is also a pressing need for many more good examples of projects that work aesthetically while delivering cost-efficiency and technological soundness. C.B. : At the same time, recent progress in photovoltaics in terms of yield and cost per m2 has made solar energy more cost competitive, as long as it is properly built into the construction or renovation project. And with rising volumes, prices should also decline. But it’s not just about cost. There is growing demand for projects built around sustainability and environmental responsibility. Yet there are technological and practical challenges: we must continue to expand the range of available solutions, improve and systematize how custom parts are produced, achieve greater reliability and do a better job of bringing everyone involved in construction projects together. If we can do all that, the market could grow by nearly 40% in the coming decade. That’s a bright future! Can solar panels ever really look good? E.R. : It is indeed crucial not to mar the architectural fabric of our built environment. The first solar panels were black or dark blue and looked like technical equipment that had been jury-rigged to rooftops. Now, thanks to major technological improvements, solar panels come in various sizes, patterns and colors, including white, and they can be dull, shiny or semi-transparent. These new products are versatile and easy to integrate into building exteriors. When the many possibilities are already taken into account in the early stages, the architect has more leeway in incorporating solar energy into the design. Can you provide some examples of the successful marriage of photovoltaics and architecture in Switzerland or elsewhere? E.R. : There are many recent examples, such as the Heron Tower, a very tall building constructed in London in 2011 and designed by the architecture firm Kohn Pedersen Fox; the solar roof on the Halle Pajol in Paris, which was done in 2013 by Jourda Architectes; and the Energy Cube, an administrative building in Konstanz created by Arnold Wild. In Switzerland, there are also a number of recent examples worth pointing out. There’s the new facade of the CSEM building in Neuchâtel, which was designed by GD Architectes in 2015 – it’s composed of photovoltaic modules with bifacial solar cells. I would also mention the first autonomous residential building in Switzerland, in Brütten (ZH), by architect René Schmid [see picture above], which was completed in 2016, and the Grosspeter Tower in Basel, created by Burckhardt und Partner AG and opened in 2017. The recent renovation of a 1970s residential building in Zurich by architect Karl Viriden also proves that it’s possible to equip existing buildings with active envelopes. 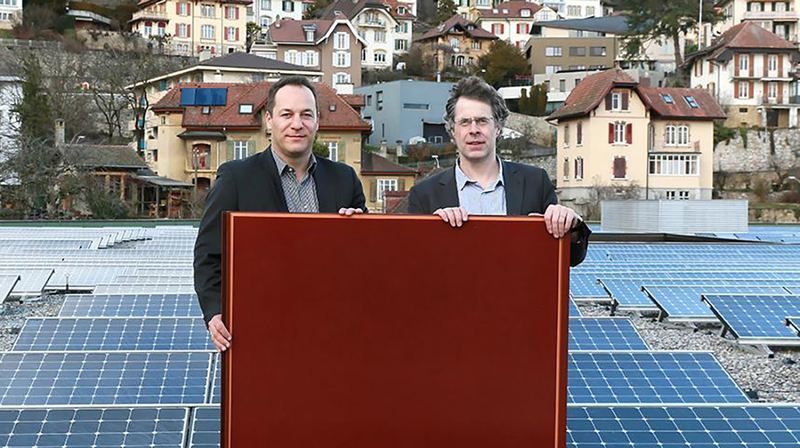 Other examples of this are the new rooftop of the Hôtel des Associations in Neuchâtel, which was awarded the 2015 Swiss Solar Prize, and that of a farm on a protected heritage site in Ecuvillens, in the Canton of Fribourg [see picture above]. C.B. : The roof of that farm was redone very effectively with terracotta-colored crystalline silicon panels, and it was featured on the cover of Nature Energy. This just goes to show how times change!